Start at the incredibly scenic carpark at the northern end of Easky Lough (44905 23723 D). Climb past the quarried area next to the carpark to reach a fence which finds the Sruffaungarve river. This provides a line of ascent on mostly easy grassy ground beside the river, negotiating between boulders on the way. 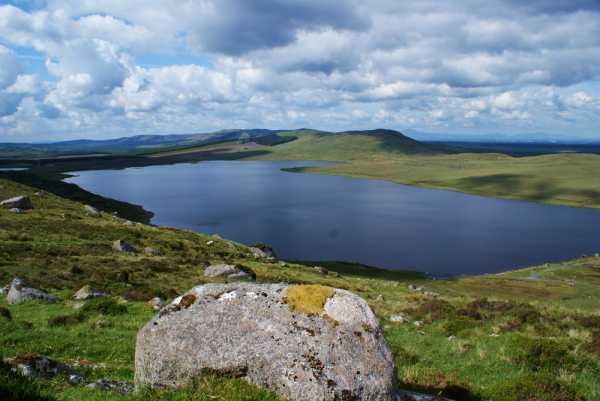 Great views over Easky Lough soon appear and views beyond to the bigger hills of Mayo. A group of large erratic boulders provide an immediate target on the way up to the plateau(45419 13659 E ). On reaching the plateau a further and more impressive group of erratics and small lough are reached (45612 23531 F ). This is a fantastic spot to clamber over the boulders trying to get good photos or just to explore. Drop slightly passing two small pools of water (45602 23280 G ) before rising to the top of Sruffaungarve. The ground on the way up was damp even after a prolonged dry spell - at the top a small pile of stones marked the top at a height of 407m. Views reach over Easky Lough SW to the Nephin Begs. The high Ox plateau takes up most of the views to the E as it rises to over 500m. Drop down NE to pick up and follow the river appearing from the slopes just below summit of Knockalongy. There is fantastic walking alongside the river and it gradually narrows as rise higher - plenty of hopping across as it meanders. Well worth stopping to look back at ever widening views. The river splits and disappears and it straight ahead to higher ground. Tough going for a while before the ground becomes easier and then enters the menace of peat hags near the summit! A white plastic filled pipe marks the summit, reached in 1.5 hours and 4.7 km. Views reach from Slieve League in the north along a vista of ocean to the heights of the North Mayo cliffs and further south to Nephin and the Nephin Begs and a distant Croagh Patrick. A long slog to Knockalongy and back beckons ahead and I couldn't resist. An easy return follows the hillside with cracking views over low bog to the coast. A group of glacial erratics is reached on Farbreagabeg 4626624433 H and an easy and gentle drop brings the return alongside the line of ascent back to the carpark.